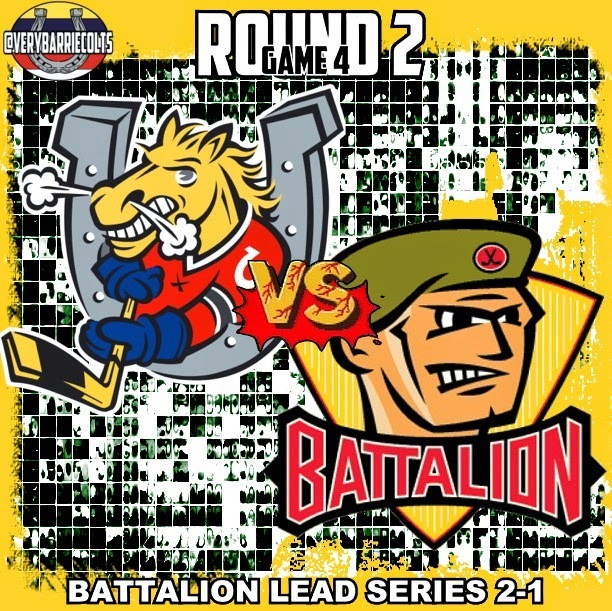 Game Preview: @OHLBarrieColts vs @OHLBattalion Game 4 in North Bay. #OHL #Playoffs - Very Barrie Colts | A website covering the Barrie Colts of the OHL. Tuesdays loss was not not a pretty one for the Colts having lost 4-2. The Battalion heavily out shot the Colts 40-15. Colts allowed 2 goals on 6 penalty kills and were unable to capitalize on 3 chances with the man advantage. Not shocking considering in the 3 games, Barrie has allowed more short handed goals (2) than they have scored on the power play. As we mentioned yesterday, Barrie has not had a strong showing so far in this series. They have been out shot 110-70 through 3 games. One area the Colts can look to use as an advantage (if they can stay out of the box) is that North Bay has only managed to score 4 goals at even strength compared to Barrie's 6 goals when playing 5 on 5. If the Colts can stay at even strength they can ties this series 2-2 tonight. That will require discipline. Another thing Barrie has going for them is the play of Mackenzie Blackwood. In fact, if you are sitting next to an NHL scout you may want to wake him/her up and tell them to watch this series. He has been the main reason this series isn't 3-0. Blackwood has been like a brick wall. Keys to Success: STAY OUT OF THE BOX. And maybe stop trying to call penalties. As of now we have been hurt more than benefited from the man advantage. Plus we are not in a position to chance getting any diving calls. The Colts really just need to worry about shooting the puck, using their speed and not turning the puck over when entering the offensive zone. Players to Watch: Mackenzie Blackwood. And Stephen Nosad. He has really played well this series and hasn't received the credit he deserves. He has done a great job of getting the puck to the net and working hard on every battle. I would look for him as a possible "quiet" hero tonight! Puck drop is scheduled for 7:00 tonight at Memorial Gardens in North Bay.